A superb column of fragrant shell pink flowers in April and May. 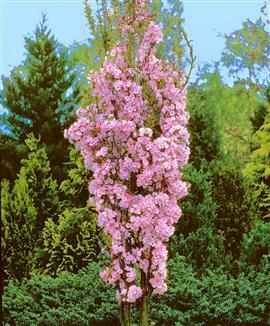 This small columnar tree with its erect branches is ideal for the small garden and accent planting in the border. The flowers are semi double and appear amongst the fresh green of the new leaves. In Autumn the foliage turns bright yellow, a very popular little specimen.